I thought you might like a little run-down on the gift projects I mentioned last time. The Icarus shawl was made for my mum's birthday with yarn left over from my wedding stole (Jaggerspun Zephyr). She really liked it. This Montego Bay Scarf was made, as mentioned previously, with a skein of Knitpicks Gossamer I won in a contest and I am really pleased with how it came out. I have a few more single skeins of variegated lace weight Knitpicks yarn I've received from various places and would not hesitate to make another similar Montego Bay Scarf as another gift or for myself. It's easy to make and looks much more complex than it really is. 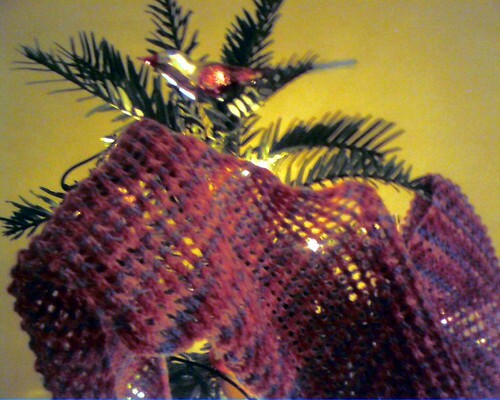 I don't have a good photo of the Montego Bay Scarf I made for my family gift exchange this year but here it is draped on our Christmas tree. I think it was appreciated by the recipient, who promptly put on the scarf (it was unseasonably cool for Christmas this year and the recipient tends to feel the cold) and she wore it the entire day. 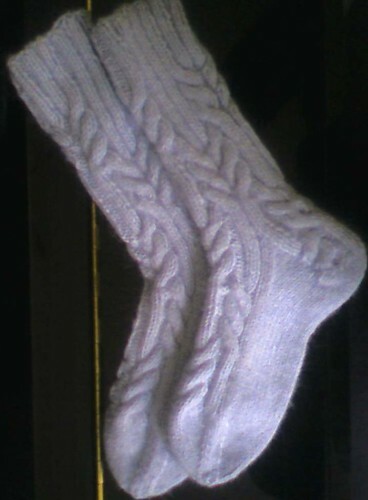 I also finished and dispatched prior to Christmas a pair of Log Cabin Socks for a friend's birthday in early January. The yarn is Naturally Sensation which has a blend of angora and merino, and it was something I just had to buy one day when I happened to wander past the LYS in a shopping mood. I had nothing in mind for the yarn, and was very pleased how it worked for the Log Cabin Socks. Each sock in the women's size used just under one skein, and I have another 2 skeins left over to make some more socks for myself. Or something else. Who knows. I love it when you buy something on a whim and then find something good to make with it, most unexpectedly. And finally, the frogged & postponed mentioned in the post title - some mittens intended for my father have been frogged once and re-started and now I think must be re-frogged. I have thus postponed the intended occasion for gifting these mittens to late February, the recipient's birthday. The problems with the first incarnation was my fly-by-the-seat-of-the-pants design approach, and the problem with the second incarnation is size. The yarn is custom-dyed for me by The Knittery in Fremantle Dockers colours - what a fabulous service! Now that all these gifts are off my plate I've managed to face casting off the Witterings Hat (it took 3 sessions of cricket to finish it) and will now being searching for the millinery Petersham and cotton laundry cord required for the finishing. Here it is looking a little ruffled around the edges, an effect which I will hopefully be able to block out in due course. Also I'm enjoying the Nutkin sock in some STR 'Jingle Bell Rock' (how seasonal of me) and am mulling over what comes next. Until then! It's 10pm on a Sunday. Where did my day go?